Folks some of you may have been exposed to a video where Egyptian TV reporters make fun of President Obama's statement that Climate Change is the biggest threat facing America today. 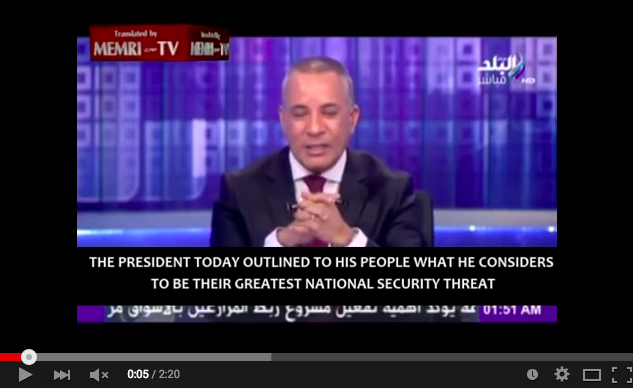 The video has the MEMRI logo and subtitles in all caps (see screenshot above). Basically they took an old MEMRI video and inserted a video of Obama's speech and new subtitles for the "Egyptian reporters." While the president's claim was certainly worthy of ridicule, this never happened. The video is a fraud and was reported to the MEMRI people yesterday. Three things made the fraud apparent. Firstly it didn't begin with the MEMRI frame asking for donations, secondly look at the subtitles on the screenshot of the fake video above and compare them to the ones on the real MEMRI video below, not only is the typeface different, the fraudulent one is in all caps. Finally the video is political in nature as a 501(C)(3) MEMRI is not allowed to make overtly political statements such as those in the fake video. Folks there is plenty of legitimate news that people can use to criticize President Obama. In fact the American reaction to the president's claim that Climate change is our biggest threat would have made a great video. But using the MEMRI name for a fraudulent claim of ridicule of Obama, without labeling it as satire, etc. only serves to damage the reputation of a valuable tool exposing the truth about what is being presented in Middle East media. If you see the fraudulent video, or any video which seems a bit off, check with the supposed source before you send around. Yesterday I made one phone call to MEMRI and got my answer in two minutes...you can do the same thing their contact info is on their website. For real MEMRI videos you can visit their home page here http://www.memri.org/ or visit their Youtube page here https://www.youtube.com/user/MEMRITVVideos/videos. And for legitimate reporting about what President Obama is doing right or wrong--continue to tune in here at The Lid.